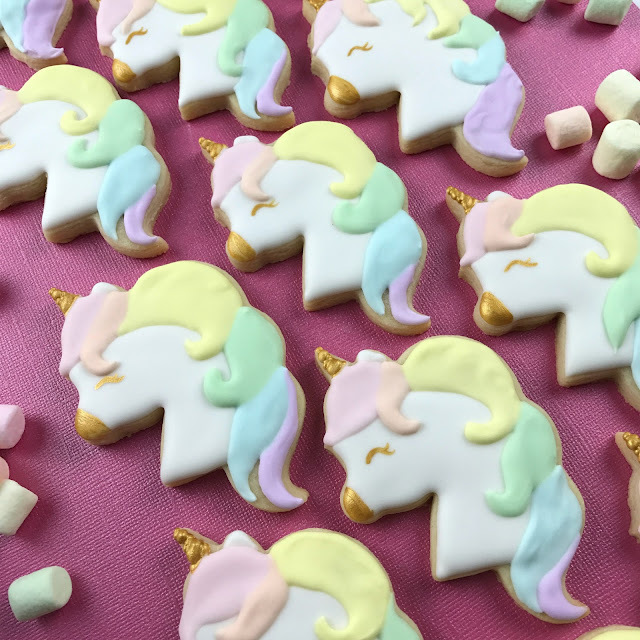 Do you dream of pastel unicorn cookies? Me too! These sweet unicorns were a recent request and I just fell in love. These are pretty easy to do and you'll find that they are wildly adored. 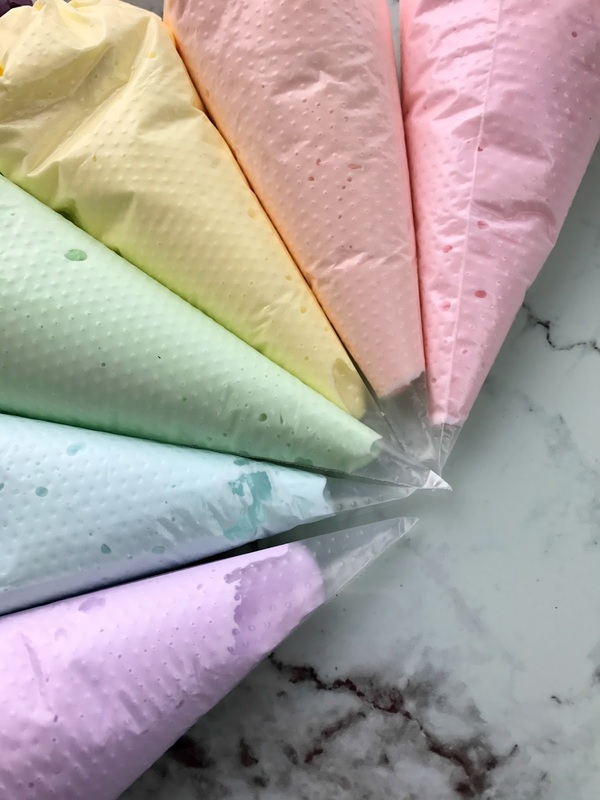 Wouldn't these be a perfect dessert for a baby shower or girly birthday party? Maybe as a cupcake topper on a bed of fluffy white buttercream. Although pastel icing isn't my go-to palette, I find that I'm working with it more and more. There's something about the soft sweetness that calls to me when I'm working with babies, weddings and magical sweets. To create this soft palette, I use the tiniest amount of Americolor gel in royal icing. This palette used: electric pink, electric orange, lemon yellow, leaf green, sky blue and violet. My unicorn cutter was from one of my favorite Etsy sellers, Bobbi's Cookie Cutters. The shape is perfect - the horn and nose are not too long and fragile. These could easily be shipped in the mail with little fear of breakage. And all that sparkly goodness on the pastel mane? Totally edible and delicious! You can pick yours up at Bakery Bling. I was over the MOON when I found this glitter - so much on the market is just non-toxic, which does not equate edible. This one is completely edible and has incredible sheen! The unicorn is completed with some shiny gold touches. I used my favorite edible gold paint on the horn, snout and closed eyelid. It adds such a shiny sparkle to the cookies - a perfect touch to these magical cookies. I just adore these magical unicorn cookies so much, I think it's my 80's inner child that misses unicorns. These are fun to make, you'll love having fun with the sweet mane. I hope you make these - let me know if you do! Want to watch my quick video? Click the movie above to see how I created mine. 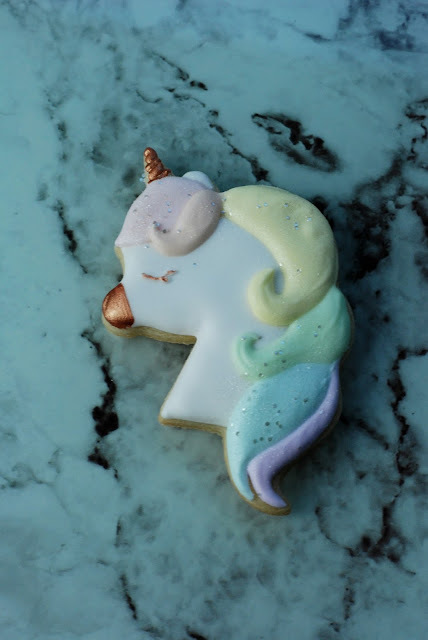 Well since my daughter is a big fan of eating cookies and she really loves Unicorn, I will be trying to make these for her and see how it goes.